Our jeep adventure lead us on the Outlaw Trail today in the Red Canyon Valley of Sedona in the Coconino National Forest. The trail was very scenic with great view of the red rock cliffs. These beautiful red cliffs still house the Indian ruins of settlement long lost. 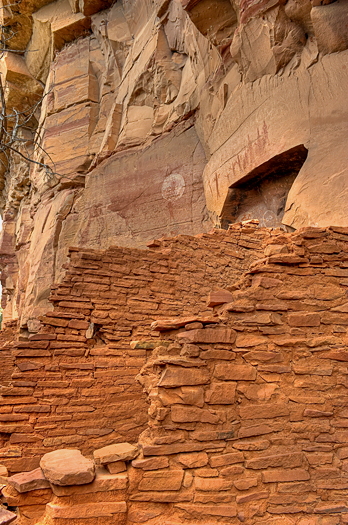 Palatki and its sister site, Honanki were the largest cliff dwellings of the Red Rock country between A.D.1150 – 1300. They were first described by Dr. Jesse Walter Fewkes, famous turn-of-the century archaeologist from the Smithsonian Institution, who gave them the Hopi names of Honanki (Bear House) and Palatki (Red House). The Hopi, however, have no specific names for these sites. I hiked the two trails at Palatki Heritage Site, one trail that takes you to the Sinagua cliff dwellings, and a second that goes to the alcoves that shelter the painted symbols, or pictographs from every native culture to ever occupy the Verde Valley. 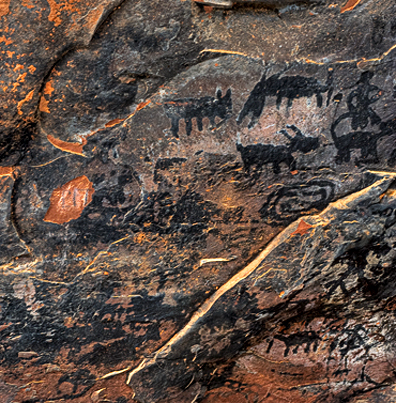 I took a small pic of one of the pictographs to share with you. One can only use your imagination to translate the stories these images must have told. The cliff dwellers were hunters (deer, javelina and rabbit) and farmers of beans and corn. It was fun to share this adventure with Joe, Becky, Todo and Buster our new jeep friends.